Artist's concept of Mars One's anticipated colony on the Red Planet. A private Mars colonization effort is asking for your help to make its bold plans a reality, and it's dangling a pretty hefty prize as an incentive — a trip to suborbital space. The Netherlands-based nonprofit Mars One, which aims to land four astronauts on the Red Planet in 2025, announced today (Sept. 4) that it's raffling off a round-trip suborbital flight aboard XCOR Aerospace's Lynx rocket plane. To enter the drawing, people can buy Mars One gear or make a donation to the organization. The money raised through the effort, which is called "Ticket to Rise," will help fund a mock Mars mission here on Earth in 2015 and a robotic demonstration mission to the Red Planet in 2018, Mars One representatives said. Ticket to Rise is a collaboration involving Mars One, the online tech magazine Motherboard and the Urgency Network, which organizes fundraising campaigns. To learn more about the project, visit https://www.urgencynetwork.com/marsone. Mars One wants to set up a permanent colony on Mars. If all goes according to plan, the first four settlers who touch down in 2025 will be joined every two years by additional pioneers, gradually building up a human presence on the Red Planet. There are no plans at the moment to bring any of these people home to Earth. 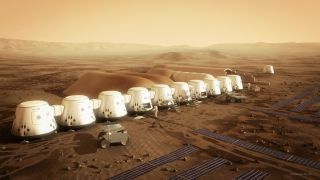 Mars One plans to pay for most of its activities by staging a global media event around the colonization process, from astronaut selection to the settlers' time on Mars. The selection process has already begun; the organization has whittled its stable of astronaut candidates down to 705 from an initial pool of more than 200,000 applicants. XCOR's one-passenger Lynx vehicle is designed to take people and scientific experiments to suborbital space and back again, much like Virgin Galactic's SpaceShipTwo spaceliner. A ticket aboard Lynx currently sells for $95,000, while you'll have to plunk down $250,000 to ride SpaceShipTwo.